A road trip of a special kind: The Porsche Panamera embarked on an adventure across Austria. 60 per cent of all new Panamera models that have been delivered in Europe had a hybrid drive. 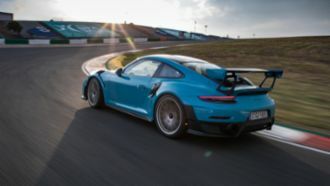 A selected group of journalists had the opportunity to experience the new 911 GT2 RS in in Portimão, Portugal. Journalists from all over the world had the opportunity to test the third generation of the Cayenne. The roots of Porsche lie in motorsport. The 2018 Porsche calendar pays tribute to the racing history. With the 911 Carrera T, Porsche is reviving the puristic concept behind the 911 T of 1968. Porsche is introducing the elegant Porsche Macan Turbo Exclusive Performance Edition.